Dehumidifier features include 70 Pint capacity. Washable/Reusable filter. Optional garden hose connection adapter for continuous operation. Soleus Air 70-Pint Portable Dehumidifier. This Soleus Air 70-Pint Portable Dehumidifier is in great working condition. 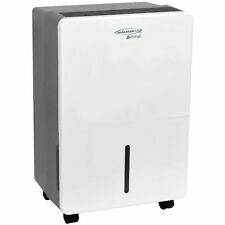 Soleus Air 70-Pint Portable Dehumidifier HMT-D70E-A Features Casters make this dehumidifier easy to roll room-to-room while the washable and reusable filter keep maintenance convenient. In excellent condition. See photos. Soleus Air® dehumidifiers exceed UL standards and feature safety technology to make them safer to use. Install the included drain tube and pump water up to 16', so that you never have to empty the bucket. Of course, if there is a custom humidity level that you prefer, it can always be manually set using the digital humidistat. Caster wheels make this dehumidifier easy to roll from room-to-room while the washable and reusable filter keep maintenance convenient. Of course; if there is a custom humidity level that you prefer; it can always be manually set using the digital humidistat. Caster wheels make this dehumidifier easy to roll from room-to-room while the washable and reusable filter keep maintenance convenient. 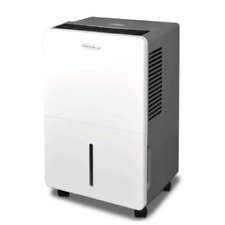 Product Title SoleusAir DS1-70EIP-210 Dehumidifier (DS170EIP210). Of course, if there is a custom humidity level that you prefer, it can always be manually set using the digital humidistat. Caster wheels make this dehumidifier easy to roll from room-to-room while the washable and reusable filter keep maintenance convenient. Soleus 70-Pint Portable Dehumid w/pump. This Soleus Air 70-Pint Dehumidifier is in great working condition. Soleus Air 70-Pint Dehumidifier. This Soleus model can also be run in continuous mode without the pump by simply attaching a garden hose to the continuous drainage port on the back and leading it to a floor drain. Freestanding design takes up minimal space allowing the installation to be placed almost anywhere. The included casters allow this unit to be moved around the house with ease. Depth: 11-1/4". Automatic shut off the unit when the water tank is almost full, avoiding overflow. Residential Use:Basement, Single Room; Manufacturer-Suggested Room Size (sq. ft.):800 sq. ft.; Practical Room Size:1200 sq. ft.; Energy Star:Yes; Wi-Fi Capable:No; Bluetooth Capable:No; Water Container:Yes; Water Container Capacity:16.9 pints; Pint Capacity:70 pints; Internal Condensate Pump:No; Full Bucket Indicator/Auto Shutoff:Yes; Continuous Drain Capable:Yes; Drain Hose Included:No; Low Temperature Operation (41 degrees F and Under):No; Lowest Operating Temperature:41 degrees; Low Grain Refrigerant (LGR):No; Desiccant:No; Controls:Electronic; Auto-Restart:No; Humidistat:Yes; Automatic Defrost:Yes; Fan Operation:Runs Continuously; Number of Fan Speeds:3; Maximum Cubic Feet per Minute (CFM):205 CFM; Maximum Amperage:6. Continuous mode drains the dehumidifier into a low-level drain via garden hose (hose not included) for worry-free operation. Omni-directional casters easily rolls unit from place to place, plus side handles for easy lifting and carrying.